This item is 4GB Microsd + MicroSD TF to OLYMPUS XD Picture Card Adapter is working same as a XD Picture Card for some compatible Olympus Cameras . (see compatible list below). 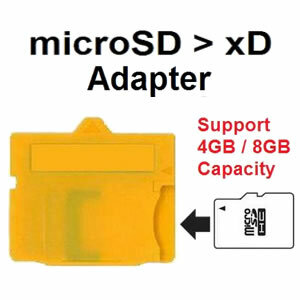 This microSD to xD adapter's form factor (shape) is different than standard xD card. Forcing it into an incompatible camera or any other equipment, it may damage camera or card or cause malfunction with the equipment. The images on the memory card may be destroyed.